Electrical shock torture suspected; autopsy report claims he stuck hand in electrical outlet. The body of Vam Ngaij Vaj, who died in police custody in Vietnam’s Central Highlands. LOS ANGELES (Morning Star News) – A Hmong church leader in Vietnam has been beaten to death in police custody, area sources said. 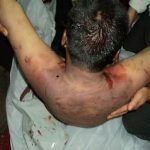 Police beat Vam Ngaij Vaj around his neck and shoulders and likely used electric shock on him, resulting in his death on March 17, said a church leader who spoke with those who viewed the battered corpse. 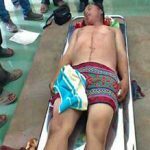 “They think he could have been electrocuted as well as beaten,” said a Hmong Christian leader in Vietnam. Vaj, of Cu Jut District, Dak Nong Province in Vietnam’s Central Highlands, and his wife were clearing brush from their field in nearby Dak Ha Commune of Dak Glong District when they were arrested for “illegally destroying the forest” on March 16. Hmong churches in the Central Highlands often report harassment by a communist regime that views Christianity as a threat, and the spurious charge of “destroying forest” on their own property was consistent with such harassment. The husband and wife were transported to a police station in Gia Nghia Town and placed in separate cells, Christian sources said. That night Vaj was savagely beaten and tortured by police, the sources said, and the next day local authorities informed his younger brother that he had died. This news came as a shock as Vaj, in his late 30s, was in excellent health, the sources said. They added that the killing terrorized the Hmong Christian community. Police informed Vaj’s younger brother that an autopsy would be performed, and officers subsequently announced that he had died from electric shock by placing his hand in an electrical outlet. 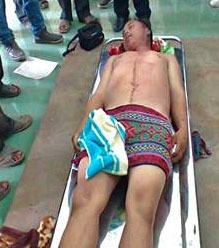 The body of Vam Ngaij Vaj after autopsy. A photo of Vaj’s neck and shoulders show signs of severe trauma. Those who saw the corpse said they suspected electric shock had been used, consistent with the announced cause of death. Hmong Christians and their leaders believe such ill-treatment comes because they are Christians. Since the mid-1990s, more than 35,000 Christian Hmong have fled their native area in Vietnam’s Northwest Mountainous Region to the Central Highlands, some 800 miles south, because of pressure and persecution from authorities and sometimes from Hmong animists. Conditions have not been much better for some who moved to the new area. Pushed to marginal lands, the migrating Christian Hmong with great effort carved out fields, built shelters, and planted crops. It was the experience of many that just when the first crops were ready for harvest, they would be expelled on one pretext or another and have to repeat the back-breaking process. Local authorities or military officers then sold the confiscated, newly-developed land to ethnic Vietnamese settlers or to large agricultural companies. The many indigenous ethnic minorities in the Central Highlands, collectively called Montagnards, have long seen their traditional lands confiscated with no compensation or recourse. Mass protests that erupted against land grabs and religious persecution in the Central Highlands a decade ago were brutally crushed by the military. An estimated 100 Montagnard Christian men still languish in northern prisons for their participation in those protests. Vaj’s body was eventually released to the family, and the church arranged a funeral and buried Vaj on March 21. Vaj’s family members belong to a Hmong Protestant congregation in Cu Jut District, where he served as a church elder. This congregation belongs to the government-registered Evangelical Church of Vietnam (South), Vietnam’s largest Protestant body. In sending out this news about the murder, Hmong Christian leaders risked their welfare by asking for international intervention in hopes of some justice. Their own denominational leaders, they said, were too timid or afraid to advocate for them. May God reach out and bless all of Vaj community and strengthen at this time. Pray that God will do a mighty work to open the eyes of the Vietnamese Leaders to the reality of God. Pray that the spirit of fear and confusion will leave the Vietnamese Leaders and the Holy Spirit will reside in them with love compassion and forgiveness as God will forgive them if they repent. Why is the UN and other world police organizations not involved with this non-humane act? Perhaps because the population being affected isnt white. Lets all stand up and push these third world countries to allow freedom of speech and freedom religion. It will not corrupt their corrupted country anymore than it already is. 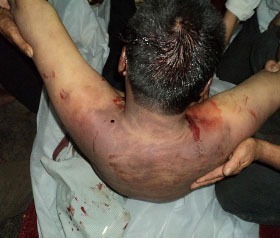 God has been set up the hell for those devil’s Vietnamese officer of that beaten him. God mercy Vam kai Vaj his soul in heaven including his brother.